The Japanese shrub has a desirable landscape feature for the home garden because of its attractive red leaf color that turns to purple or yellow in the fall season. It is a deciduous broadleaf plant that grows best in USDA hardiness zones five through eight. The shrub grows large and reaches a height and spread of 20 feet when not pruned. Some people prefer to prune the shrub into a tree form because of the large size it reaches. 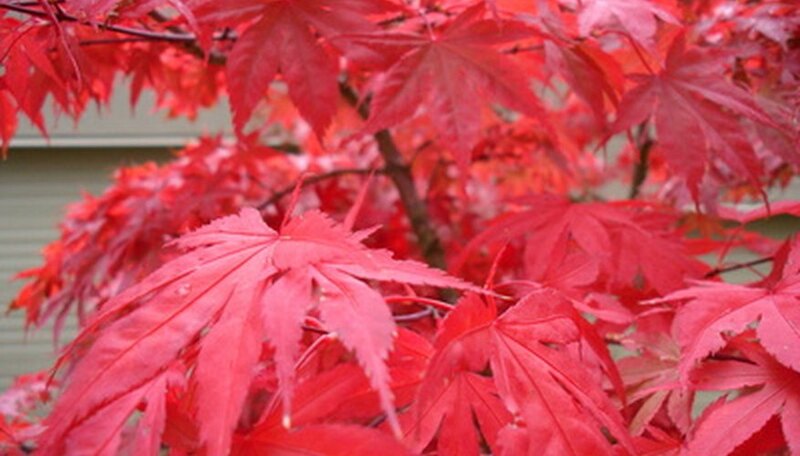 Japanese shrubs grow best in an area that receives partially shaded sunlight and has a well-draining soil. The red leaf colors keep their brilliance when the shrub receives at least six hours of sunlight, preferably from the cooler morning sun. Complete a soil pH test prior to planting to verify it is acidic with a pH below 6.5. Adding ground rock sulfur to the planting area at least two weeks before planting will lower the pH for best results with growth. Set the Japanese shrub in a hole that is two times wider and the same depth as the root ball. Amend the removed soil by mixing in organic compost to improve the water-draining properties and increase the nutrient value of the soil around the roots. Place the root ball into the hole so the top of the ball is at ground level, and pack amended soil around the roots. Do not stomp on the ground over the root ball as this may damage the tree. Saturate the soil over the root ball with water to compact the soil and eliminate air pockets. Japanese shrubs grow best when the soil is kept evenly moist throughout the hot summer growing season. Apply supplemental water to the soil over the root ball during dry periods to prevent the soil from drying and causing stress to the shrub. Place a 3-inch layer of organic compost bark around the shrub and over the root ball to retain moisture in the soil. The shrub requires one fertilizer application in spring with a balanced woody shrub fertilizer to stimulate growth. Japanese shrubs require pruning to maintain a healthy structure and encourage growth. It is possible to prune the shrub into tree form by removing the lower branches to create a trunk. Cut off broken, diseased and damaged branches in early spring before the shrub comes out of the dormant stage. Remove branches growing out of the main stem in the wrong direction and those with narrow crotches. Never remove more than one-third of the branch growth as this will stress the tree. Monitor the Japanese shrub for the presence of aphids. These insects gather on the underside of the foliage and leave honeydew residue on the surface. Shrubs with an aphid problem show the symptoms of fallen leaves during the growing season. Treat an aphid infestation by removing the insects with a sharp stream of water. Apply an insecticide if the problem continues after several water sprayings.